7 Questions with Mr. Long Panhavuth. Long Panhavuth, 38, is a law professional turned entrepreneur who set out to Pailin in the far west of Cambodia to open the Memoria Palace and Resort last August. Located in the Cardamom Mountains next to the Thai border, the minuscule province was one of the last remaining Khmer Rouge strongholds to come under government control. 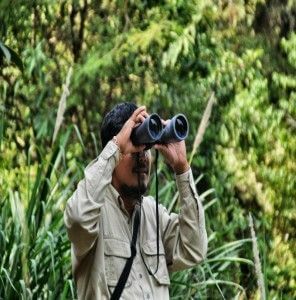 The area is now rife with poaching and illegal logging as the children of the old guerrillas struggle to earn an income. Panhavuth spoke to Bennett Murray about his attempts to bring prosperity to the region through his eco-resort. How did you end up moving to Pailin? My background is in transitional justice, which is about how one country deals with its past human rights violations, so I knew that we needed to reintegrate Pailin into the country. The problem is accessibility for the ex-Khmer Rouge and their children. When I came to Pailin in 2000, there were no training courses, no quality language courses, and nothing for these Khmer Rouge children when they finished high school. Are people in Pailin different from the rest of Cambodia? Today, I do not think you can distinguish the Khmer Rouge from everyone else. They are very friendly, and they need something new for their lives instead of finding jobs in Thailand or going down to the Cardamoms to cut down trees. The younger generation does not believe in the Khmer Rouge ideology and they do not believe that the Khmer Rouge killed people. We brought in our operations so we can train them in hospitality. At our place, 80 to 90 percent of our staff are Khmer Rouge children. My belief is that when you come to Pailin, you should not just come to develop the land, but to interact and integrate with the locals. Why is Pailin off the tourist map? The younger generation do not even know where Pailin is. If you ask them, they think it’s in Thailand. The older generation consider it the Khmer Rouge community, so they don’t want to come. They are also afraid of malaria, as well as mine fields. Furthermore, if you Google Pailin, no one recommends that you come, so foreign tourists rarely visit. Is Pailin a good place to visit? It’s all perfect! 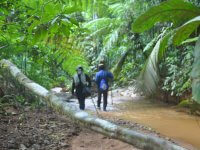 There are a lot of waterfalls, and green mountains to go trekking in, and a lot of coffee plantations. And the people are friendly, even the ex-Khmer Rouge. Before the fall of the monarchy in the 1960s, Pailin was considered to be the richest area in natural resources. Do many people visit Pailin? Typically, we’re about 40 per cent full most nights. We have some Cambodian middle class and high class tourists, and some foreign cyclists. We’ve just opened, and we’re hoping to improve. Are there problems with land mines on the site? The land where we are growing the trees was cut down by a Thai company that was gem mining on the site. They cleared the landmines. But where we built our pool, they found 120 mines at the site. What is your tree planting programme? The idea is one tourist, one tree, as initiated by the Ministry of Tourism. 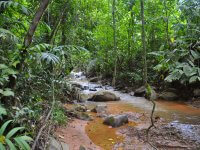 Our goal is to return 13 hectares of our land to natural forest by planting 1,000 mahogany trees. We have our own nursery where we grow the saplings. And we encourage our tourists to help. 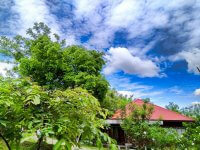 The trees are part of promoting Pailin as an eco-tourist destination. The farmers who are trying to survive, they try to cut down all the trees, and I keep telling them if you really want to have a long lasting livelihood, you need those kinds of trees because you need to support tourism.